As in the preceding Paleo-Indian period, much more is known about the Archaic in the Piedmont than either the mountains or the coastal areas. From the 1930s through the 1960s North Carolina sites in the Piedmont were especially important in the Archaic period research of the eastern United States. Chronological sequence for the Archaic period in Piedmont North Carolina as constructed from stratigraphic excavations at the Gaston, Lowder's Ferry, Doerschuk, and Hardaway sites (based on Coe 1964:123). In many parts of the country Archaic period research focused on rock shelters, where dry alkaline conditions helped preserve organic remains. But in North Carolina, archaeologists were able to define long chronological sequences by excavating deeply buried, stratified sites in the alluvial floodplains of the Piedmont. 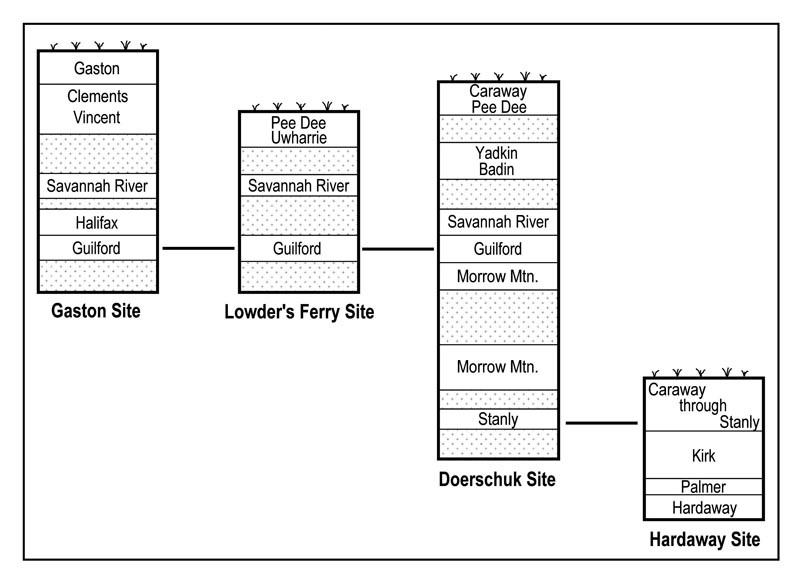 Joffre Coe's delineation of the projectile point traditions for the North Carolina Piedmont, based on stratigraphic excavations at the Gaston, Lowder's Ferry, Doerschuk, and Hardaway sites (from Coe 1964:121). In early excavations at buried floodplain sites such as Doerschuk and Lowder's Ferry along the Yadin-Pee Dee River, and at the nearby Hardaway site, the cultural sequence that still serves the Archaic period in North Carolina and throughout much of the eastern United States was established.